Air filter replacement is an important maintenance task for your HVAC system. Unfortunately, there isn’t one hard and fast rule as to when you need to change it. Learn more about why changing the air filter on your HVAC system is important, and determine how often you should change it. Did you know that the average household spends approximately $2,200 per year on energy costs? You can actually shave between 5 – 10% off your annual energy costs by regularly changing the air filter in your HVAC system. Air doesn’t pass through a dirty, clogged air filter easily. So when your air filter is dirty, your HVAC system works harder to push hot or cool air into your home, which uses more energy and raises your utility bills. Changing your HVAC’s air filter also helps you maintain a higher quality of air in your home. This is extremely important if you have pets or members of your family have allergies. If your air filter is filthy, the air coming from your HVAC system has to go through that dirt and dust, pushing it back into your home. You can keep the air in your home cleaner with routine air filter replacement. Also, it keeps the dirt and dust from clogging other areas of your HVAC system. This means the system is less likely to break down, which saves you from spending unplanned funds on emergency repairs. When is it time for air filter replacement? You can tell your air filter needs to be changed if it’s gray in color and/or you can see dirt and dust buildup on it. You might also notice that your home is dustier than usual or that your HVAC system is cycling longer than usual. All of these things indicate you should change the air filter immediately. If you have allergies or you have pets, you’ll need to change the air filter more frequently than someone who doesn’t. You’ll also need to change it more frequently if you use a lower quality thinner air filter. Consider checking your air filter on a monthly basis to see how much dust and dirt it’s collected. If it’s filthy, you should probably change it on a monthly basis, if not, you might be able to change your air filter every two to three months. While the frequency in which you change your air filter is up to you, it’s not a task you should put off. 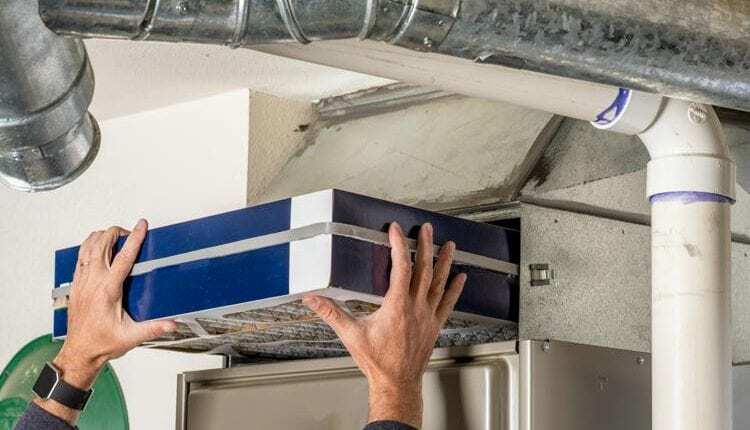 Be sure to check your air filter on a regular basis and don’t forget to call an Edwardsville, IL HVAC contractor to have your HVAC unit inspected once per year.